Easy to use; only takes one person to mount ATV on stand. Allows two positions to perform maintenance on an ATV. Folds flat to only 6in thick. Made of aircraft-quality aluminum. Frame hooks and three ratchet tie-downs keep ATV secure to stand. Frame hooks adjust with no tools needed, and lock in place when pressure is applied. Extra-wide footprint for stability. Surface plates on legs keep stand from sinking in soft soil. Big decal panel on front legs for name, number and sponsor decals. 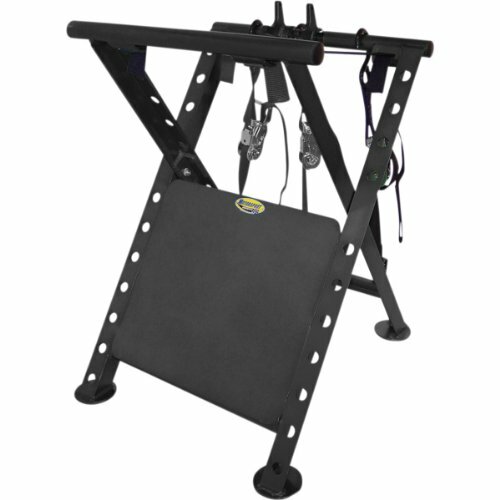 Easy to use - only takes one person to mount ATV on stand! Allows two positions to perform maintenance on an ATV. Folds flat to only 6" thick. Frame hooks and three ratchet tie-downs keep ATV secure to stand. Frame hooks adjust with no tools needed, and lock in place when pressure is applied. If you have any questions about this product by Motorsport Products, contact us by completing and submitting the form below. If you are looking for a specif part number, please include it with your message.